&More perfoms their single, "My Own Light." Philadelphia hip-hop group &More, featuring Chill Moody and singer Donn T, appeared on NPR's Tiny Desk Concert series. Chill Moody, a rapper from West Philadelphia, met R&B singer, Donn T, when the two collaborated on a song, "Clear," in 2017. The two then joined forces and started the hip-hop group &More. The group made their debut at the 2018 Roots Jam Session during Grammy Week. The group was featured this year in the "The Austin 100" for their performance at SXSW. 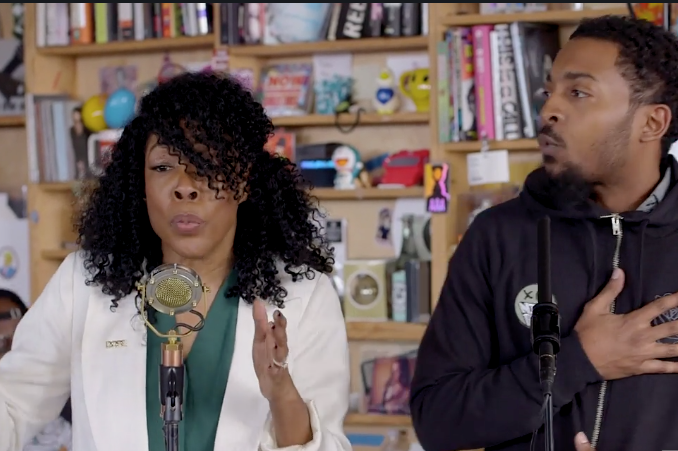 The group performed the second song of their set, "Future Come Around," before ending on their 2018 Tiny Desk Contest submission, "Whoa." The song, which was inspired by the book, "The Hate U Give," dives into the ways the country deals with racism and police violence. It will be featured on their new album with a guest appearance from Public Enemy's Chuck D. The group will be releasing their debut album, "Ethyl Bobcat," on April 5. You can watch &More's NPR Tiny Desk Concert here.